【LARGE CAPACITY REMOVABLE LITHIUM BATTERY】- 48V Lithium Battery can be charged on or off the frame, equipped with smart lithium battery charger, fast charging only need 6-12 hours. Adapting to need of your long-distance riding. 【400W HIGH SPEED BRUSHLESS MOTOR】- The E-bike wields front and rear disc brakes and Shimano 7-speed transmission system, you can adjust suitable speed to complete your journey and perfect brakes fully guarantee your safety. 【THREE WORKING MODE】- E-bike Assisted bicycle and Pure bicycle.Assisted bicycle. Three modes can be switched at any time. You can choose the e-bike to enjoy a long time travel, and also exercise, combining three modes would be a better choice(CAUTION: Any question about the E-bike from " SportArts " purchased from our store, please contact our customer service. 【Light and easy to store】fold and open, take to anywhere. This bike can support a weight of 120KG. 【CAN BE USED IN A VARIETY OF SCENARIOS】- You can use it as a TRANSPORTATION or FOLDING MOUNTAIN EBIKE to enjoy the fun. 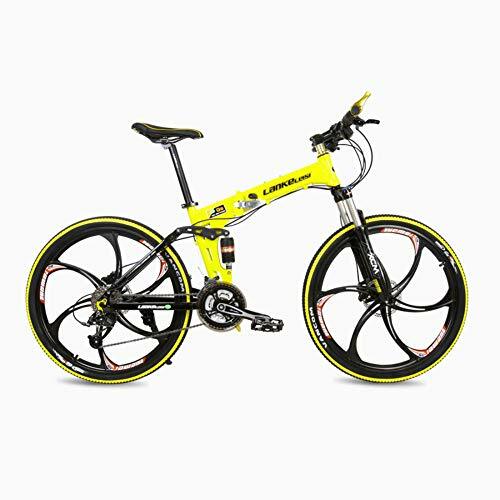 And the Frame is made of durable 6061 ALUMINUM Alloy, full suspension fork, offers smooth cushioning and shock absorption when cycling on rough terrains, enjoying the stimulate during your ride.